Died: 5th March 1917; age 29; Drowned as a result of an enemy submarine in the North Sea. Residence: 89, Albion Street, Ipswich. Employed: as a Coal Trimmer, from the age of 15 for the Great Eastern Railway river boats. Promoted to Fireman and afterwards drafted to the Continental boats. 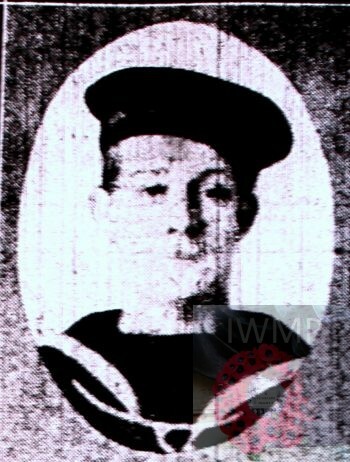 Joined the Naval Reserve – 29th October 1914, and was out at the Dardanelles for a year and seven months, when his ship was torpedoed. He was discharged from the Navy in September 1916, and went in to the Copenhagen. Rank: Fireman; Regiment: Mercantile Marine, ‘Copenhagen’ (Harwich). Relatives Notified & Address: Husband of Alice Rose Flory (formerly Chaplin, nee Bennett), of 86, Albion Street, Ipswich. 1891 1, Chapel Court, Fore Hamlet, Ipswich. William was 3 years old and living with his parents, sister & cousin. William Chaplin, 33, a General Labourer, born Barham, Suffolk. Ellen Clara Jane Chaplin (nee Worby), 29, born Ipswich. Ellen R. Chaplin, 2, born Ipswich. Minnie Webb, 13, born Ipswich. 1901 15, Albion Street, Ipswich. William was 13 years old and living with his parents & sisters. William, 43, an Engine Fitter’s Labourer. Emily Alisa Chaplin, 8, born Ipswich. Ethel Maud Chaplin, 5, born Ipswich. Florence May Chaplin, 4, born Ipswich. Gertrude Elizabeth Chaplin, 2, born Ipswich. Elsie Victoria Chaplin, 1, born Ipswich. Lilian May Chaplin, born 1909, Ipswich. William C. Chaplin, born 1912, Ipswich. Helen V. Chaplin, born 1914, Ipswich. + a child born in 1917, Ipswich.